My mornings usually begin with coffee and a LinkedIn post. Sometimes I will post around midnight to take advantage of other time zones where others are waking while we are getting ready to sleep. Either way I find great value in the minimal amount of time that it takes to put together a worthwhile post. That value is, of course, the free traffic that is generated by those posts. Typically, my News Feed posts yield-- on average—1,000 views daily. More importantly, those posts result in 13-17 views of my profile each and every day. Thus, my profile gets seen and my “calls to action” in my profile are read by many first-time viewers. While these marketing efforts are substantial there is another element in my routine that is even more exceptional. Each week I log in the names of the groups to which I have started a discussion (or posted to an existing discussion). This way I know exactly which groups I need to rotate to and make a more current post. Since I have joined 50 LinkedIn groups, I know that if I make at least five group submissions a week I will have contributed to all my groups over the course of a 10 week cycle. Over a year’s time I know that I am visible to millions of group members every 10 weeks and that they are seeing my discussions 5 times every year! That adds up to enormous free exposure and effective marketing. Utilizing a systematic and organized approach has other benefits as well. I don’t get overwhelmed thinking that I have 50 groups to keep up-to-date. I focus upon 5 per week. Do you recall the saying about eating an elephant and that it is done one bite at a time? LinkedIn’s CEO, Jeff Weiner, has stated that social selling is comprised of “finding, connecting and engaging“. My posting system works extremely well in terms of the engaging aspect. Since I am nearing the 30 million network member mark it is obvious that my ability at finding and connecting has been accomplished beyond the norm. By posting regularly I add value to others, stimulate conversation, ask open-ended questions, respond and like other member contributions. Those are all essential fundamentals of engagement. It is important to choose your 50 groups effectively and with specific purpose. A doctor should not just connect with others doctors because that will yield few client leads. It would be more strategic if the doctor sought out groups in his or her immediate locale that gain membership around the topics of health, longevity, exercise and local social activities. People that share these interests and attributes might gain the doctor clients or patients for the long term. Targeting a market is one of least developed skills among my many contacts. Most don’t want to spend any time doing it or just don’t understand how to do it. It really is an amazing phenomenon. Jeff Bezos of Amazon put it this way: “If your customer base is aging with you, then eventually you are going to become obsolete or irrelevant. You need to be constantly figuring out who are your new customers and what are you doing to stay forever young “. What age of client do I relate to the best? Do I like early stage detection or treating late term illness? Which type of current client provides referrals? What is the median income level of my patients? Do my clients tend to be active in social groups or are they more sedentary? What are some of their hobby interests? This type of analysis can reveal important clues about where those “ideal” or potential customers are located. It then becomes much easier and effective to “trawl” in those ponds where the fish are actually swimming, eating and living. In addition to utilizing an efficient system of posting and possessing an awareness about future client tendencies and interests I suggest one other important “success” piece. While it sounds boring it is the most challenging of all factors highlighted. That 3rd element is empathetic communication. While sharing the best content and talking to the right audience puts one ahead of most in the social selling game that alone does not “seal the deal”. Relationships are enhanced when engagement is done is a timely manner and in a way that deepens or broadens the conversation. Said another way, “likes” and “comments” are fun to accumulate but they don’t create valued relationships unless they are responded to in an authentic way. Multiple contacts are required to create trust and the willingness to work together in a closer way. For example, when I post and members react with a comment or a like to my post I go into an investigative mode. I check to see if all the respondents are connected to me at the 1st level or not. For those that are #1s I endorse a skill of theirs or send them a Thank You message. If I find a 2nd or 3rd there I will reach out to them with a Thank You message as well and invite them into my network. In this manner, my posts are also useful prospecting excursions. Follow up is the key. It strengthens the ties with those already in my network and it serves as a point of shared interest from which a larger conversation can begin with those new to my network. Similar opportunities exist throughout the LinkedIn world. LinkedIn informs about promotions, birthdays, changes in profiles, group discussions, who has endorsed you and much more. All are openings useful for a beginning point with a new contact. Who knows? Perhaps that new connection might happen to have that incredible, life-changing offer that you have been working hard for in order to make it materialize. 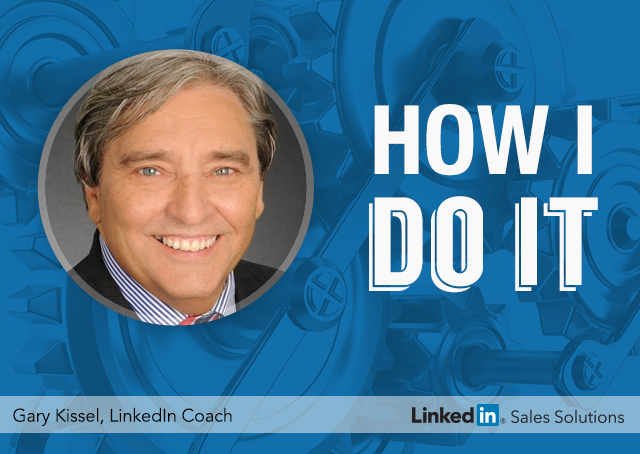 Here are three (3) activities to implement in your LinkedIn routine that will generate many more opportunities for success. Join at least 30 groups and post to 3 groups a week. In ten (10) weeks you will have posted to all 30 groups at least once. This is a system for potentially reaching hundreds of thousands of group members AND for being in front of them five (5) times over the span of a year. Develop a clear understanding of your “ideal” client. What is their profession? What hobbies do they pursue? Which method of contact do they prefer? Are they joiners of social or civic organizations? Keep a list of the attributes nearby so that they are clearly in the daily consciousness. Create “conversations” with your connections with the intent to learning more about their wants, needs, desires and dreams. Knowing their why is just as important of knowing your own purpose. Engage, engage, and then, engage some more! Few members are this organized and focused. By developing these habits leads will appear more readily and more sales will ultimately result. You will be surprised (as I was) at how many repeat purchases are made by the top connections. These are but some of the benefits of building long-term relationships with those that are convinced that you care as much about them as you do for yourself. I wish continued success to you all.